Steve Jobs did it, Oprah does it, Client Eastwood loves it, Liv Tyler and Mick Jagger use it, most exceutives of Google, Linked in are practicing it and this is something even you can engage with as a busy solo-entrepreneur or small business owner. What is it? Meditate to dissolve negativity. Meditate to become alive again. Meditate to tap into, tune into and vibrate in the vortex of Creation or the source. Meditate yourself to success (whatever that means to you). 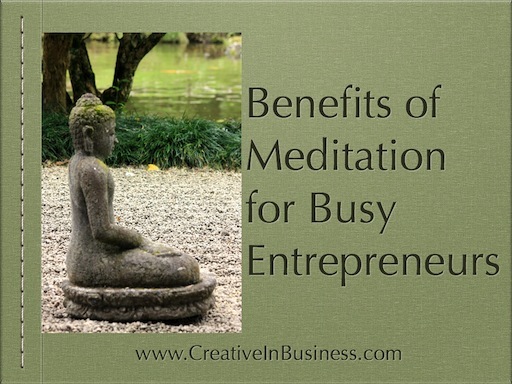 Join host Kelly Galea for this episode of “Creative in Business” where we’re talking about the benefits of meditation with Adwiti Haffner. Click on the Listen Now button below to enjoy this episode (or click on Get Podcast to subscribe to our show on iTunes). Originally from Darjeeling, India, Adwiti traveled the world before settling down in the USA about 12 years ago. She is an author, healer, spiritual mentor, and meditation master. Connect with Adwiti at www.alivewithadwiti.com. Want to check out more episodes of the “Creative in Business” show? Click here.